Safe for humans and animals! 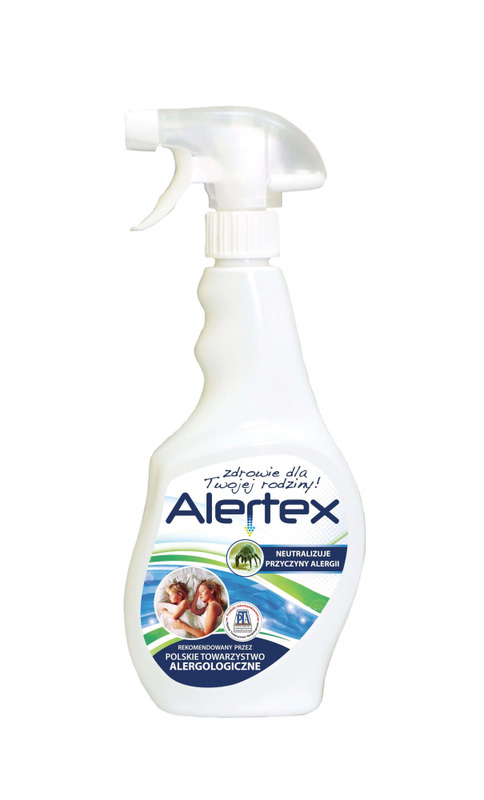 Help people sensitive to home dust, animal fur and pollen allergens. The product is for cleaning carpets, blinds, mattresses and tapestry. Special formula binds all types of allergens, including home dust mites, mite excrements and micro particles of pollen into larger non-volatile agglomerates easy to be eliminated with a common vacuum cleaner. Spray on the carpeting, tapestry, mattresses and blankets (do not use on bedding). Rub the product into the surface using a brush or a sponge and to dry for about 1 hour. Vacuum clean or dust the surface afterwards. One of the most significant discoveries in Allergology was in 1964, when Voorhorst et al. Found that basic allergen of home dust is mites of Dermatophagoides species (dermatophagoides pteronissimus and D. farina in particular). Mites are small (up to 0.5 mm) arachnids. They eat the strip off human and animal epidermis and the remains of hair or nails. They survive up to 3 months in optimal conditions and reproduce their kind every 3 weeks (one mite has 25-30 offspring). Such reproduction speed means that the initial count of mites is restored in 1-2 weeks after laundry washing or cleaning. There is up to 1,000 of mites per 1 g of home dust! Mite excrements (each mite excretes 20 times a day) are even more important to allergic people. A teaspoon of home dust (about 1 g) can contain up to 250,000 of such excrements. The excrements are so small (10-24 m compared to 100 m thickness of a hair) that each move of blow makes a cloud of them up in the air. The mites use ferments (proteins) DER p1 or DER f1 (two of the strongest allergens) to digest the remains of skin. About 100 million people of the world are allergic to home dust mites. 450,000 of people sensitive to mite antigen live in Poland. It was found that the children in contact with strong allergens within the first 6 months of life often have increased bronchial sensitivity in the form of bronchial asthma, atopic rhinoconjunctivitis and sensitivity to home dust mites. That is why newborns must also be protected from the contact with home dust mites. Special formula binds all types of allergens, including home dust mites, mite excrements and micro particles of pollen into larger non-volatile agglomerates easy to be eliminated with a common vacuum cleaner.